Besides being able to produce prototypes quickly and efficiently, 3D printers are also able to create complex shaped pieces that are impossible to make using traditional manufacturing techniques. That’s why American Standard has embraced 3D-printing for its new line of twisted faucets that seem physically impossible. 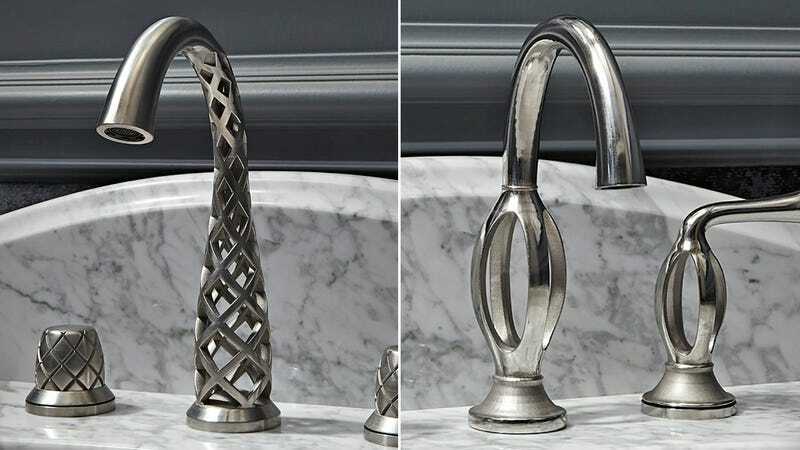 3D-printed from actual metal so they’ll last just as long as a more traditionally-designed faucet will, the three new designs in American Standard’s DXV line might leave your houseguests scratching their heads. Two of them do a fantastic job at making it seem as if the water pouring out of the faucet is coming from nowhere, while the third appears almost as if it’s made from flowing liquid metal frozen in time. The unique designs are truly stunning, and do a wonderful job at demonstrating just what 3D printing technologies are capable of. Good luck trying to make these using more traditional metal-casting techniques. That being said, mass-production of 3D-printed objects is still a little tricky. It actually takes about 24 hours to produce these designs using an additive laser sintering process on metal powder, and they still need to be further hand-finished and polished afterwards. That’s why American Standard expects them to each for sell for anywhere from $12,000 to $20,000 when finally available next year. Oof—I guess we’ll just stick to our less-magical garden hose.